At the recreational and lower competition levels, players are generally not to fussed about what ball they play with, but at the higher level players often have a preference for certain balls as they have refined their skills and are much more sensitive to basic properties of the ball. Although table tennis balls made by only a handful of different manufacturers around the world, and re-badged for the different brands, there is still significant variation among the brands, as the table tennis companies seem to impose their own unique specifications. As of 2004, the Giant Chinese manufacturer Double Happiness (DHS, headquarter in Shanghai pictured right), was estimated to be manufacturing about 80% of the world’s supply of competition balls, re-badging them for the other major table tennis companies! To obtain ITTF approval, the ITTF have very strict specifications for the balls, and during the process some very accurate scientific tests are carried out on the balls to ensure it meets all the specifications. Tests are carried out on the Weight, Sphericity, Diameter, Bounce, Veer, Hardness, Colour and detailed checks are done on the markings, general appearance and packaging. Deviation from any of these specification can results in non-acceptance of ITTF approval. Further details can be found in the ITTF Technical leaflet on table tennis balls. As a result, very accurate equipment is required for the manufacturing. Since there is always some deviation from the specification within a batch of balls, the balls are usually sorted by another machine (a machine sorting by mass pictured left). 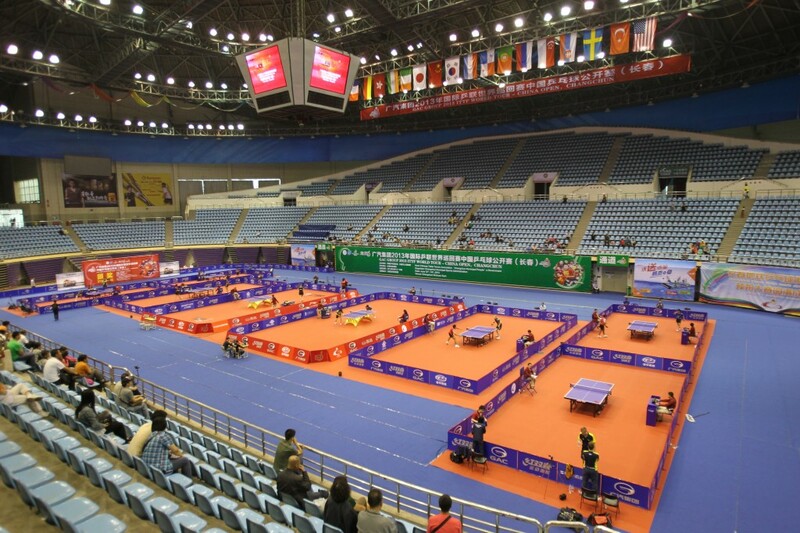 Most serious table tennis clubs around the world that engage in competitions and tournaments endorse the ITTF rules, and as such only ITTF approved balls can be used, of the colour specified also by the ITTF. For details on which balls are approved you can check the ITTF approved 40mm balls list. Here is a short video of the manufacturing process of balls made by Nittaku, Japan. Note: It can be a little slow to load at times, and there is a short commercial at the start, but it’s worth it!